Boxing – On June 2, 2017, the Philippine pride Manny Pacquiao an Eight division champion and the reigning, defending WBO welterweight champion of the world faces the much younger and unbeaten Australian challenger Jeff “The Hornet” Horn. The Historical match was scheduled for 12 rounds of boxing where the WBO welterweight championship is on the line. Thousands of boxing fanatics attended the event at Suncorp Stadium, Brisbane, Queensland in Australia. Pacquiao who’s already 38 years old gives a 9 years, disadvantages in age against Horn, who is only 29 years old of age, aside from the age Pacquiao is also much smaller than Horn giving 4 inches differences in height, but Pacquiao has all the advantages when it comes to experiences and as a matter of fact Pacquiao is the favorite of winning the fight. As the bout starts both fighters give their best in the fight that exceeded to 12 rounds of boxing both fighters are bloody mess all over their face, Pacquiao suffered two accidental headbutt that caused the bleeding in his head while Horn has a serious cut near his eye that flows all over in his face. The bout was a great fight both fighters give their all till the last bell of the 12 rounds, Manny Pacquiao seems he had this fight as many boxing experts and analyst see’s it from round 1 to round 12 but when the decision was announced all three judges see’s it differently as they favored the hometown fighter by giving a unanimous decision all in favored of Jeff Horn. The boxing world suddenly erupted in social media, giving sympathy to Manny Pacquiao, many netizens expressed their emotions that Pacquiao was the true winner, he was robbed twice already and the fight was the worst decision in boxing history. 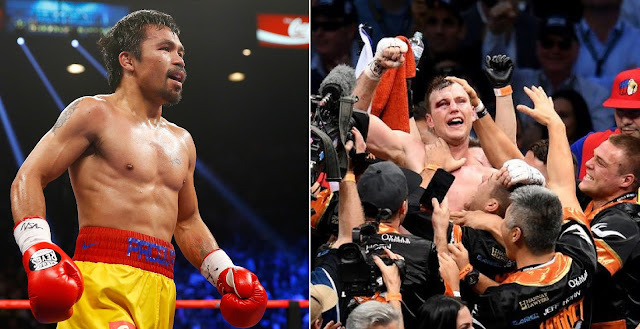 Despite the controversial loss of Manny Pacquiao, he is entitled of a boxing rematch against Jeff Horn by the end of this year, which included in their contract and Pacquiao already clear that he will not retire despite the loss. Meanwhile, boxer Timothy Bradley, who lose twice to Manny Pacquiao in their own trilogy said that he see Pacquiao winning the fight, but then again the match is in Australia that’s why the fighter from Australia was declared the winner of the fight? No Comment to " Boxing Enthusiast Shock by the Results of Pacquiao/Horn Bout "